Back in April I posted pictures of the cottage we were going to rent in Maine this summer. Not long after I posted the photos I got an email from Sarah Faragher who told me that she had spent time in the house when her aunt rented it years ago. Sarah’s email delighted me not only because of the coincidence, but because she was a lurker on My Porch–one of the unknown millions (tongue-in-cheek) who read My Porch but don’t comment. Then it turned out that Sarah, painter and former used bookstore owner, was going to be on Islesboro participating in a group art show at the same time that we were going to be on the island. And even better, she emailed me to tell me that she brought a couple of books for me and that she would leave them at the show for me to pick up. We may be an odd bunch, but book lovers sure do love to share book love–even with people we don’t know. Well you can imagine that I didn’t just want to pick up free books, but I actually wanted to meet Sarah when I picked up the books, so I made a point of going at a time I knew she would be staffing the show. And then I had a thought. What if I hated her art? I have zero ability to lie effectively about such things. I would be the worst poker player in the world because everything I think can be read on my face. How could I meet this stranger and then coo about her work if I didn’t like it? I walk into the old schoolhouse (or was it the town hall?) and not knowing what Sarah looks like, I wasn’t quite sure what to do. So I headed straight for the guest book (something I normally do not sign) when a woman to my right says “I know you…” at the same moment I notice to my left a group of very striking paintings that are right up my aisle. I silently hope that these are Sarah’s works, because I can also tell at a glance that there is some stuff there that just isn’t my cup of tea. After some chit chat it turns out that the paintings that drew my eye were indeed Sarah’s work. Not only a big sigh of relief but genuine pleasure in being able to coo over her work. And though I didn’t think I was in an art buying mood, it took me about 30 seconds to realize that I was going to buy one. I was hemming and hawing over which one it would be but the one you see here was always the front runner. The decision might have been harder if another painting that I really liked hadn’t already been sold. And I haven’t even mentioned the books that Sarah brought for me. I will save that for another day’s post. I have lots of book-related posts swirling in my head after two weeks of not blogging. 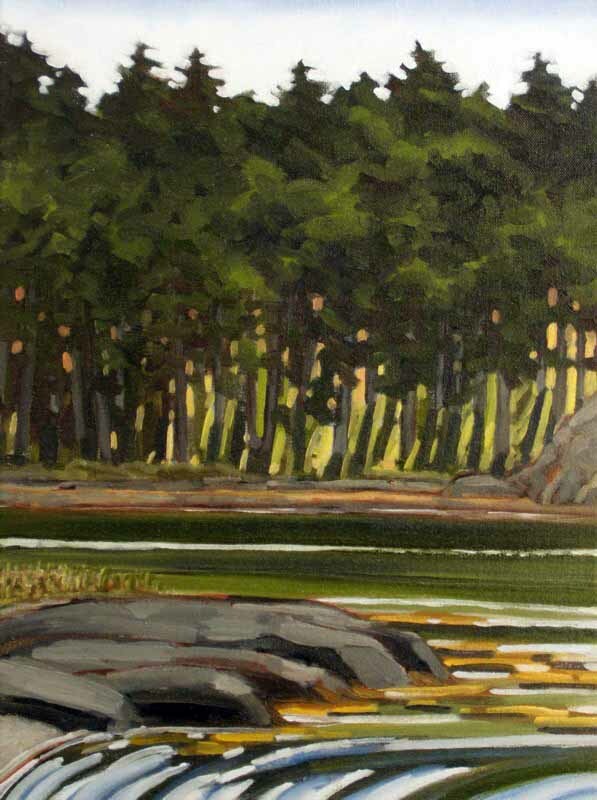 For now, you can enjoy one of Sarah’s views of Islesboro, Maine. Fabulous story. And congrats on the new painting. Curious as to what books you received. Deep serenity in this lovely painting. A splendid purchase. De-lurking briefly to say thanks for the post, Thomas, and particularly for the kind words about my paintings. It was lovely to meet you and John and Lucy in person, after getting to know you all here on My Porch. Love the painting – and the story!